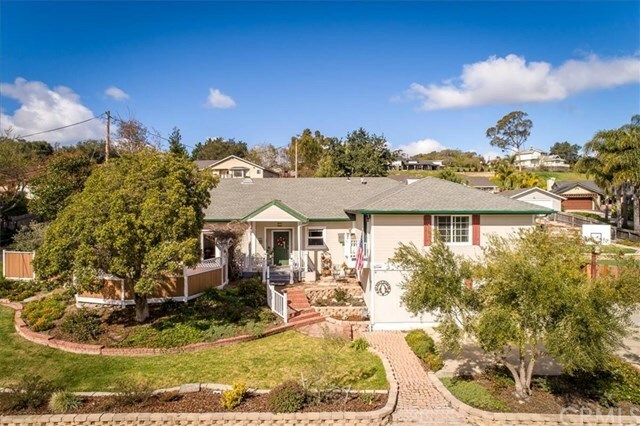 Quintessential Arroyo Grande Village charmer, this 4-bedroom, 4-bathroom, 2,860 sq ft home sits on a beautiful half acre lot! The home features a recently remodeled kitchen with granite counters and newer appliances. A bright and sunny living room includes a cozy bay window, bamboo flooring and access to the private brick patio. The dining area is centrally located in the heart of the home and is perfect for entertaining. A family room, one bedroom and bathroom completes the main level. On the upper level you will find 2 guests bedrooms, a bathroom, and a recently added master suite. The master bathroom boasts a soaking tub, separate tiled shower, two sinks with granite counters and a lovely stained glass window. The master also has a sitting area/ library. The lower level game room features a wet bar, bathroom, laundry area and access to the garage and side yard. Meandering through the back yard you will find several fruit trees, sand box, large grass area, RV parking, a vintage storage shed/ work shop, a fire pit and even a chicken coop! Directions: From Branch St, take Mason up to Tally Ho, turn right. Go past James Way, home is on the left.